During Summer 2018, SPFT and the American Federation of Teachers partnered with Saint Paul Public Schools to run a program called Select St. Paul: Our Students, Our Schools, Our City. 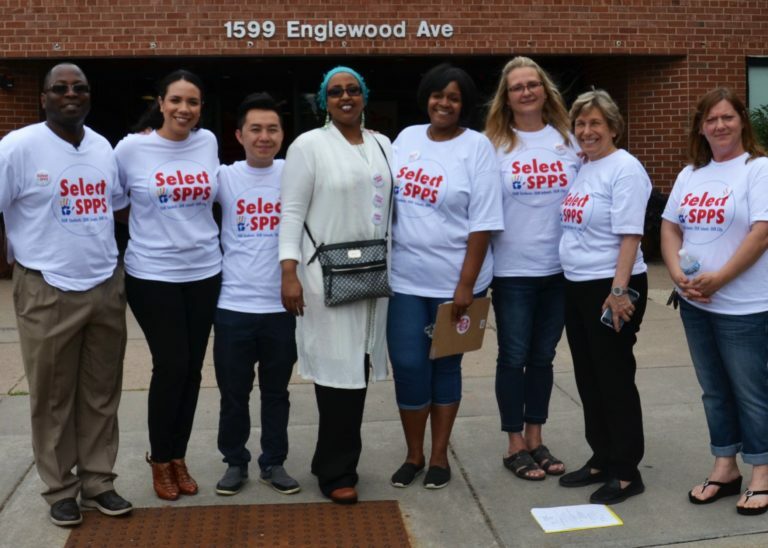 This summer canvass program arose as an agreement between SPFT and SPPS during our last round of negotiations. As part of Agreement #1, the district and the union agreed to partner on ways to seek additional revenue for public schools. In addition to seeking partnerships with large corporations and medical and higher education nonprofits to secure additional financial support and jointly lobbying for increased state and federal funding, the district and the union also agreed to collaborate on a program to bring students back to public schools in Saint Paul. The Saint Paul program is modeled off of a similar canvass AFT supported in Baltimore. The partners hired SPFT members to work as family advocates to talk to families over six weeks this summer about the amazing things happening in Saint Paul Public Schools. Canvassing began June 25, 2018 and ran through August 4, 2018. Family advocates focused on connecting with families who live in neighborhoods around targeted schools. All together, family advocates visited over 7300 families and enrolled more than 100 new students in Saint Paul Public Schools! SPFT estimates these new enrollees will bring over half a million dollars to SPPS.